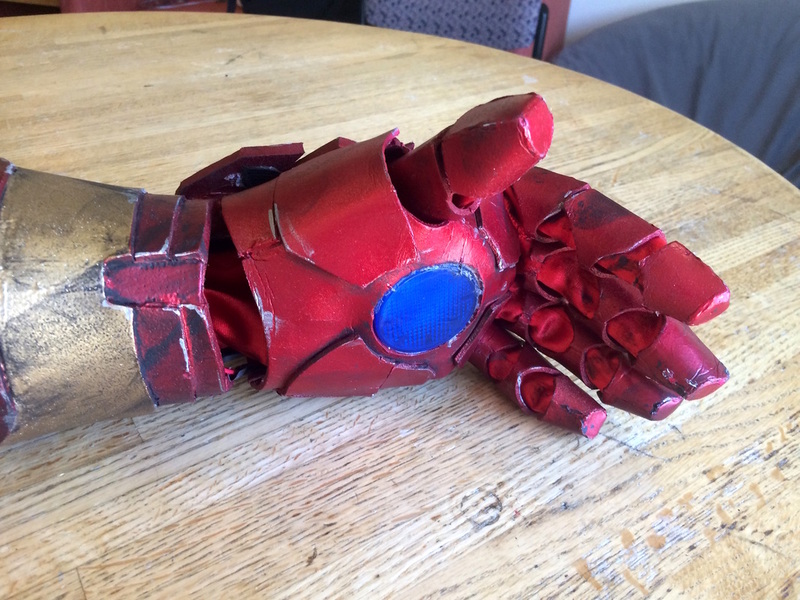 Features: Fully functional palm repulsor light and sounds with hand gesture activation. 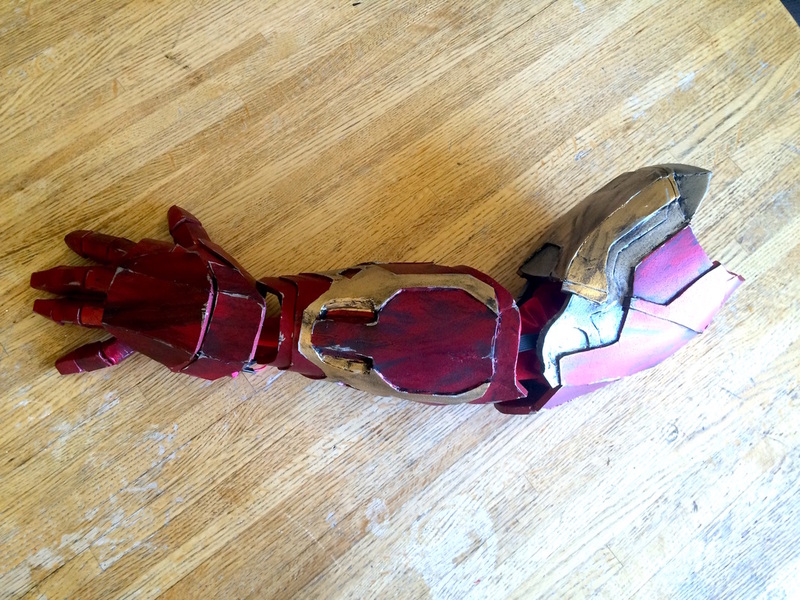 Fun Fact: This arm was made for the premiere of Avengers: Age of Ultron! With the heavily anticipated release of Marvel's The Avengers: Age of Ultron movie, I decided to create a quick prop to wear to an early viewing event that I acquired tickets for. Looking at the trailers for the second Avengers movie, I saw a new suit (the Mk. 43) that seemed what appeared to be the Mk. 42 (as seen in Iron Man III) with a different color scheme. With an arm from the new suit visible in the trailers for the movie, I decided to quickly complete an arm for the movie premier. This prop was made out of EVA foam (6mm thickness) then covered in 3 coats of Plastidip before having paint applied to its surface. 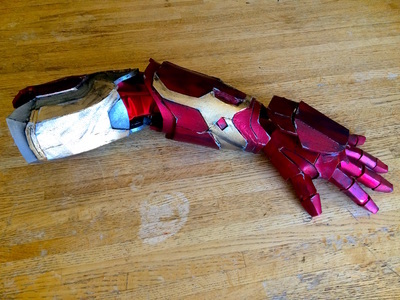 The same techniques that were used for this prop were later used to create a full Iron Man mk. 7 suit. Much of the practice and experimenting done with this project expedited the full suit build. 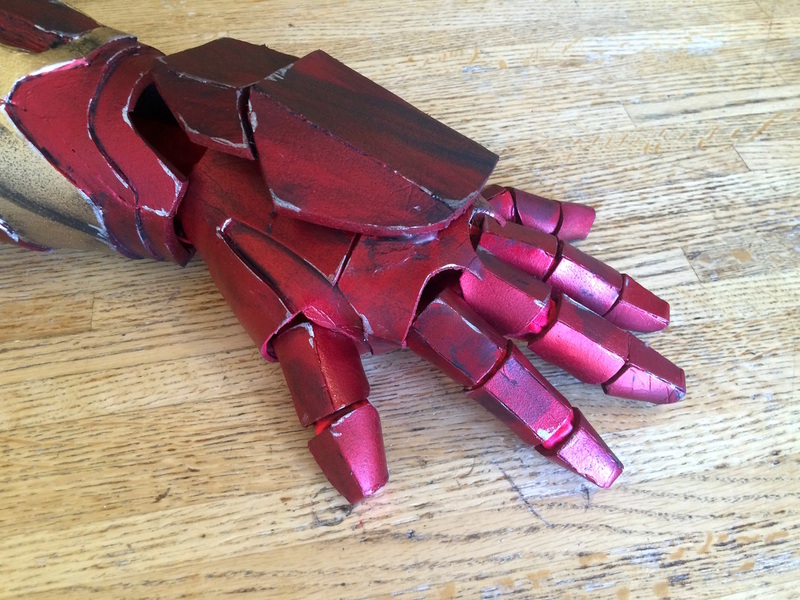 The weathering for this prop was done in several washes of blacks, browns, and reds, with simulated metal chips to accent certain edges of the piece. Weathering the arm really brought it to life, giving the arm a story of hard-fought victory. Electronics include a magnetic reed switch located in the wrist section of the arm that triggers audio and lights in the repulsors when the hand is tilted back. 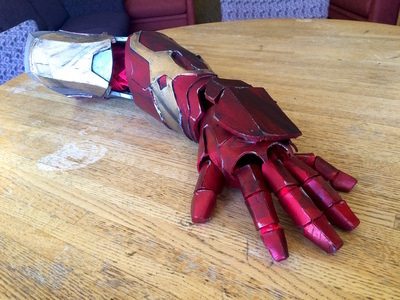 This arm was a BIG hit among friends, movie goers, and even students/professors around campus and was definitely a project many will remember. Walking around with the arm on and seeing the joy people were experiencing seeing a movie hero come to life was amazing. Here's "to peace in our time"!